Life's guilty pleasures always feel just that little bit naughty. That second piece of chocolate cake or binge watching episodes of The Bachelor. They aren't really that bad, they just feel like they are. My personal guilty pleasure is camping on a school night. 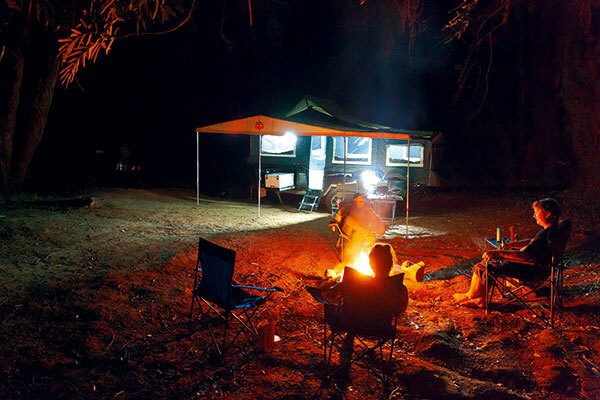 That sneaky little mid-week getaway when everyone else is working hard and you're sitting around the campfire enjoying fresh air and good times. So, that's how I was feeling, just a little bit guilty, as I headed out to Stoney Creek Campers in Ipswich to pick up the brand’s forward fold camper, the SC-FF6, for a Thursday night rendezvous with nature. 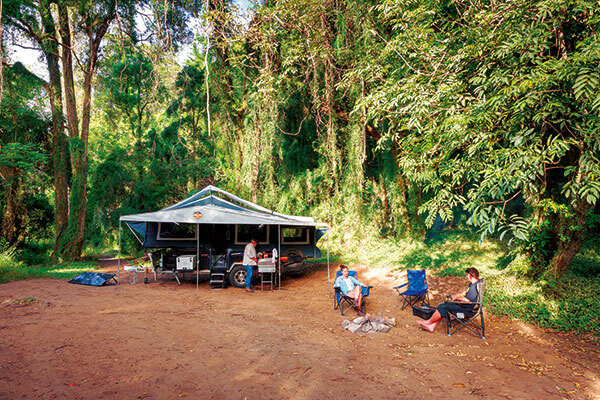 This six-berth camper has been designed for the growing family, and we were heading off to the beautiful Scenic Rim region of South East Qld to put it through its paces. Designed and assembled in Australia (Stoney Creek has assembly plants in both Qld and WA), these Chinese manufactured units offer a quality fit and finish at an attractive price point. Constructed from 2.1mm zinc-anneal sheet with a hard wearing powder coat finish, the camper sits atop a heavy duty, hot dip galvanised 150x50x4mm thick chassis running on Cooper ATS 265/75R16 tyres wrapped around alloy rims. Keeping the camper behaving itself behind the tow vehicle is fully independent suspension with twin shocks and coil springs (with adjustable limiting chain) along with AL-KO 12in HD electric brakes. 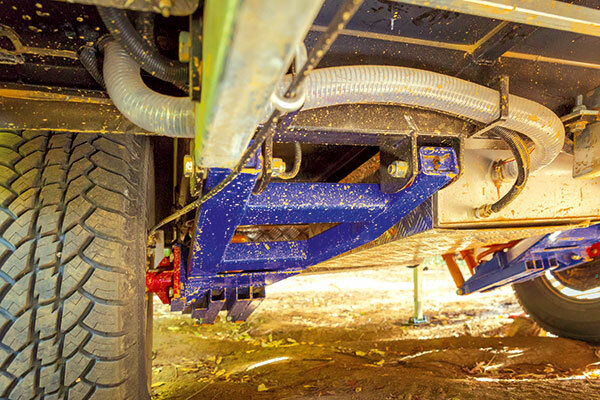 All Stoney Creek Campers are fully seam welded, which not only makes the whole unit more rigid but also makes them far more dust and waterproof. These features, along with a 12-month offroad warranty will give you peace of mind tackling tracks from Cape York to Kununurra. Staying underneath, you've also got your stainless steel watertanks which are protected from flying debris by aluminium checkerplate shrouds. If you were paying attention, you would have noticed that I said, “tanks”, as in plural. That's right, you've got a 100L tank and a 40L tank, each with their own 12V pump. I really like the idea of these being separate tanks. Remember that old saying of not putting all your eggs in the one basket? All other wiring and plumbing underneath has been run nice and high out of the way and is protected by split tube convolute or clear tubing for the gas lines. Up front, the drawbar houses the twin 9kg gas bottles as well as two more jerry cans for that big desert adventure, in behind the full width stone guard. Then there's the front winch to aid in the setting up of the camper and the 10in swing away jockey wheel. Keeping you attached over the rough stuff is the ever-reliable DO35 hitch, double safety chains and manual hand brake. Up on top, aluminium checker plate and full length perimeter tie down rails allow for all manner of items, from a small tinny to canoes, to be secured during transit. Only thing is, being a forward fold camper, these items will need to be removed prior to set up. As with most things, setting up the camper can be done by one person but is easier with two. Drop down the stabiliser legs, unclip the four over-centre locking latches and fold the floor forward, which is assisted by gas struts. If setting up by yourself, the winch attached to the drawbar will be your saviour in this situation. The twin wheel carriers on the back of the camper swing open next, allowing you access to the pull-out rear drawer, housing a double bed with innerspring mattress. A clever design feature is how the swing-away wheel carriers actually support the slide-out bed by way of an adjustable arm and screw thread, eliminating the need for any extra poles or legs. Now it's just a matter of climbing inside the camper by way of the swing-down steps and tensioning the internal poles, pulling the double stitched 14oz canvas taut. 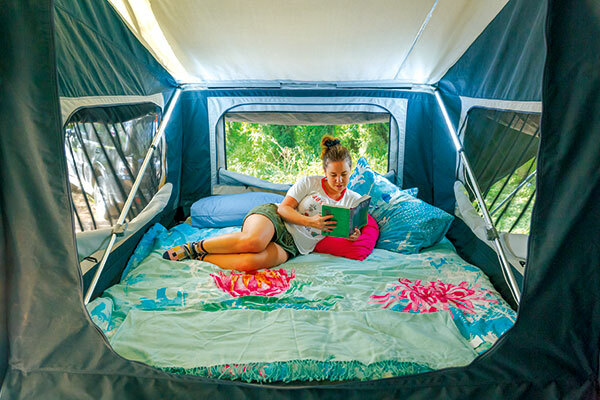 The canvas also has a permanently attached tropical roof, providing additional rain protection and helping to keep the camper cool on those hot summer days. 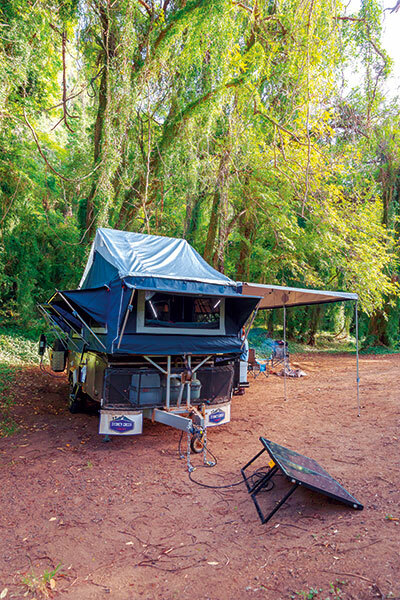 All windows, which feature midgee proof mesh screens, have their own external awning as well as an internal canvas lining, in the event a storm rolls through in the middle of the night. As well as the double bed on the pull-out drawer out the back, there is also the king-sized innerspring mattress up the front, which can be separated from the rest of the camper by way of a canvas divider. The dinette, with enough room for six around the table, converts to another double bed, giving you a total of six sleeping berths. Internal storage is limited to a couple of drawers and small cupboards at the foot of the king-sized bed. A few internal pockets in the canvas tent for smaller items would be a useful addition. Cleaning up those muddy boot prints is easily taken care of thanks to hard-wearing vinyl floors. The master control panel in the dining area seat base monitors battery voltage and water levels, has additional 12V sockets and the switch for the internal LED lights. There is a double 240V GPO nearby as well. The four LED lights provide for a very bright interior, however I would have loved for the front and rear lights to be operated independently, ideally with a dimmer as well. Having to get out of bed to turn the lights on and off may grow tiresome after awhile, especially if you enjoy a good book before turning in for the night. A courtesy LED light for the stairs is also provided with its own switch. Enough about the inside, it's time to head outside and see what else this camper trailer has to offer. Let's start with the biggest item first: that awning. It's massive and runs down the entire length of the camper, offering plenty of shelter from the elements. If conditions become really inclement you can also add annexe walls and a floor for more protection or to provide a secure sleeping area for additional happy campers. Quick release adjustable aluminium poles keep tension in the canvas and provide enough stability to self-support the structure. In windy conditions, guy ropes and pegs would be needed to prevent the camper from being picked up and blown away, as there is nearly as much canvas here as what you would find on Sydney Harbour on Boxing Day. Taking shelter under the awning is the stainless steel kitchen. 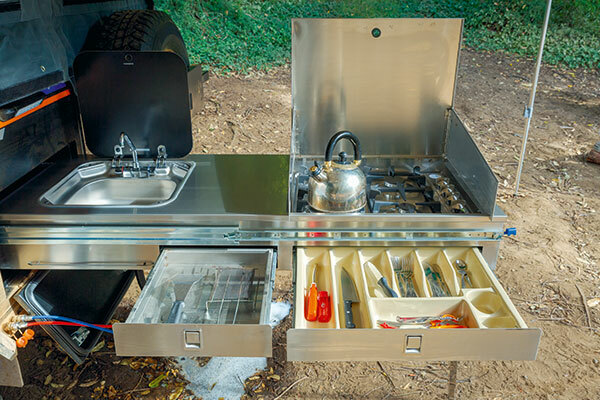 Incorporating a gas four-burner cooktop with windbreak, prep area, sink plumbed with hot and cold water, and two large storage drawers for cutlery and other kitchen utensils. This slide-out unit is supported by an adjustable fold-down leg. The only external LED light is conveniently located at the kitchen area. The canvas sidewall of the camper above the kitchen can also be rolled up out of the way, providing an indoor/outdoor area. With storage at a premium, every conceivable space has been utilised on the SC-FF6. Forward of the kitchen area is the fridge compartment, which houses up to an 85L fridge on a pull-out slide. Our test unit was fitted with the EvaKool 85L fridge/freezer, which can be purchased as an optional extra. The fridge compartment is wired up with an Anderson plug, along with an additional 12V socket and LED light for those midnight fridge raids. Next to the fridge, a small pantry area has two slide out drawers for dry food storage. On the other side of the camper, the forward storage compartments are basically a mirror image, with a smaller storage locker towards the front and a larger locker behind the fridge slide. These also feature pull-out drawers and would be suitable for a second fridge or small gen-set. Next up are two small hatches which contain the on-board, hot and cold shower. There is also an option for an additional portable gas hot water system that attaches to a bracket on the spare wheel carrier at the rear of the camper. You'll also find a gas bayonet fitting located at the rear, as well as quick release nitto fittings for the water. Another small hatch houses the 240V mains circuit breaker. Located at the very rear of the trailer is the heart and soul of the camper. At least the heart and soul of the camper’s power. Two 100Ah batteries are shoe-horned into the final storage locker, as well as the isolation switch and fuse panel. Charging is taken care of whilst driving via an Anderson plug connection on the drawbar. A 240V charger can be wired in as an optional extra. 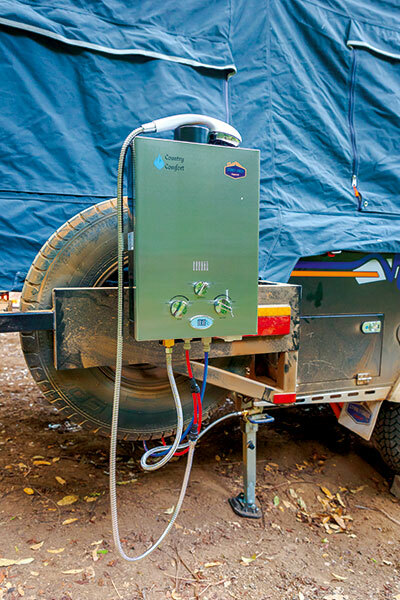 Filler necks for the two water tanks are also located along the road side of the camper, along with the switches for the 12V water pumps and a 240V mains power connection for when you find yourself at a caravan park. At the very rear of the trailer there is a 50mm receiver which can be used for a bike rack when driving, or for the winch to help when packing up the tent. What's missing from the back of the trailer, and which is something that I would love to see, is a couple of rated recovery points. 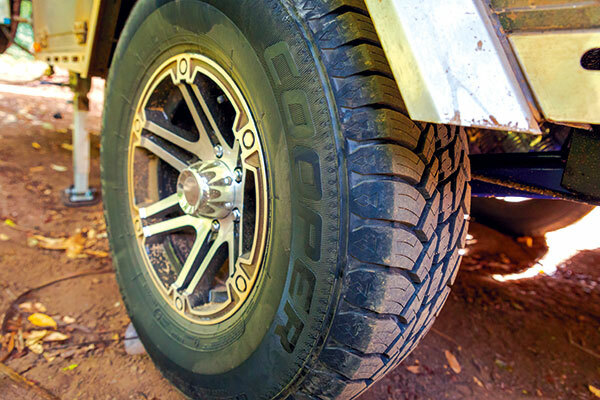 To be taken seriously as a true offroad trailer, these need to be fitted. For those looking to get off the grid and stay there for longer, the SC-FF6 has been pre-wired for solar panel connectivity. Solar panels aren't a standard feature, but can be purchased as an optional extra. 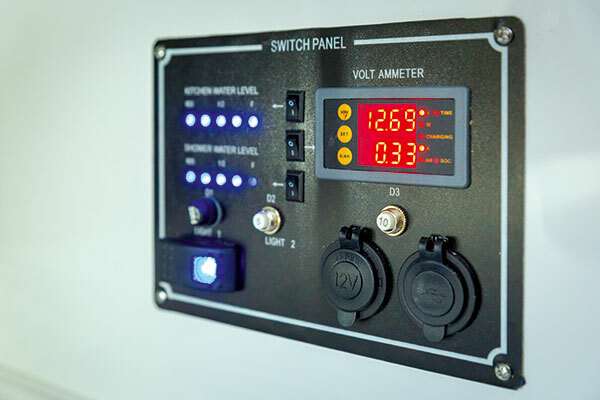 With our heavy reliance on gadgets these days, and just about everything we use needing to be charged at some stage or another, I would have loved to have seen a 240V inverter offered as a standard fitment. Again, this can be purchased and wired up as an option. 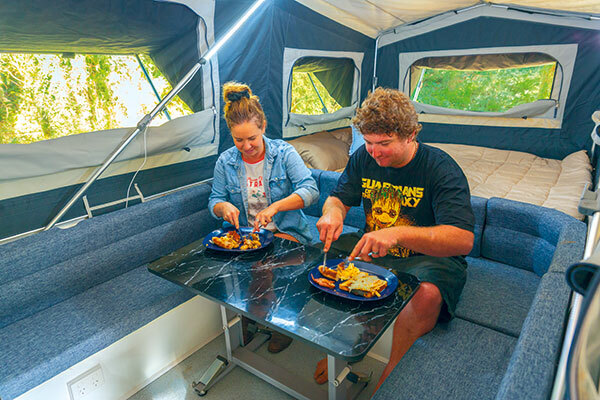 The Stoney Creek SC-FF6 is definitely the sort of camper that a family could grow in to, with the ability to sleep six and a lot of living space, both inside and out. I felt as though the SC-FF6 was a bit of a contradiction, however. On one hand it offered a lot, but on others it still wanted for so much more. 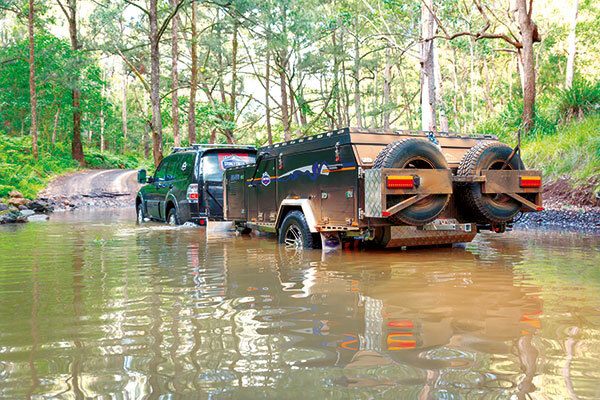 It wants to be an offroad camper trailer with its big 6in chassis, independent suspension and Cooper Tires, but it doesn't have any recovery points. Too many things that are 'optional extras', like solar panels, 240V charging and 240v inverter should be standard fitment for an offroad-ready trailer. Having said that though, the SC-FF6 is still a great camper ready for your family adventures. Check out the full review in issue #126 of Camper Trailer Australia magazine. Subscribe today for all the latest camper trailer news, reviews and travel inspiration.